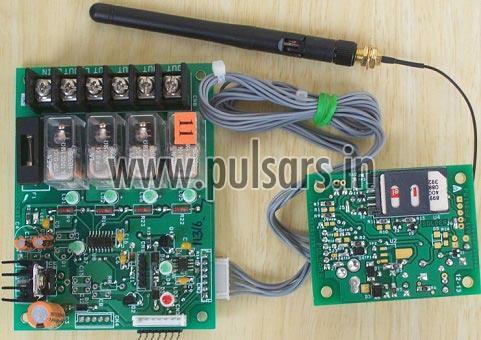 We present efficient assortment of GSM Based Controller that takes analog as well as digital inputs. We provide GSM Based Controller in a safe packaging box to avoid any breakage during transit. We have a vast network of distributors and logistic service providers that enables us to make timely delivery of GSM Based Controller. Besides, we are reputed Supplier and Exporter of GSM Based Controller. GSM Controller can accept both analog (like Temperature) and Digital (like â��Door openâ�� or â��Switch closeâ��) Inputs. It can control 4 outputs ( 1 C/O relays that are rated for 220V AC @ 3A). Supports quad band frequencies, GSM 850MHZ, GSM 900MHZ, DCS1800MHZ, and PCS1900MHZ. Input status can be sen to the designated mobile number on demand or at set time period interval. Configuration is possible through message from user.